My grandparents came to visit me recently. I’d been looking forward to their trip for ages. They came to stay with my Pop’s brother in Sydney, who’s been ill, but had promised to come for a day trip to Canberra to visit me. I’d planned to take them on a picnic to the Australian National Botanic Gardens. I thought they’d like that. I wanted to get a good loaf of bread, some aged cheddar from South Coast Cheese, good ham, and nice tomatoes. Simple things done well really can be the best, and I thought they’d appreciate all that. But I wanted to make something sweet for dessert. I had a few duck eggs left, and knew they made the best sponges. I thought a sponge roll would be picnic friendly, I could wrap it up in paper. Filled with strawberry cream it would slice beautifully at the picnic, and be the perfect finish to the meal. It went down an absolute treat. I would recommend it highly. Wash your strawberries and remove the green tops. Roughly chop the strawberries and cover with the caster sugar. Preheat the oven to 180oC. Grease a 24x30cm slice tin with butter and line it with baking paper. In the large bowl of your electric mixer, beat the egg whites until soft peaks form. Set aside. In the small bowl of your electric mixer, beat the egg yolks, sugar and vanilla until a ribbon trail forms when you lift the beater. Fold the yolks into the whites. Sift over the flour and fold until combined. Pour the mix into the prepared tin and bake for fifteen minutes, or until a skewer inserted into the centre comes out clean. Cover the cake with baking paper, then a damp tea towel and let it cool for half an hour. Meanwhile, fold the macerated strawberries into the cream. Dust a piece of baking paper with icing sugar. 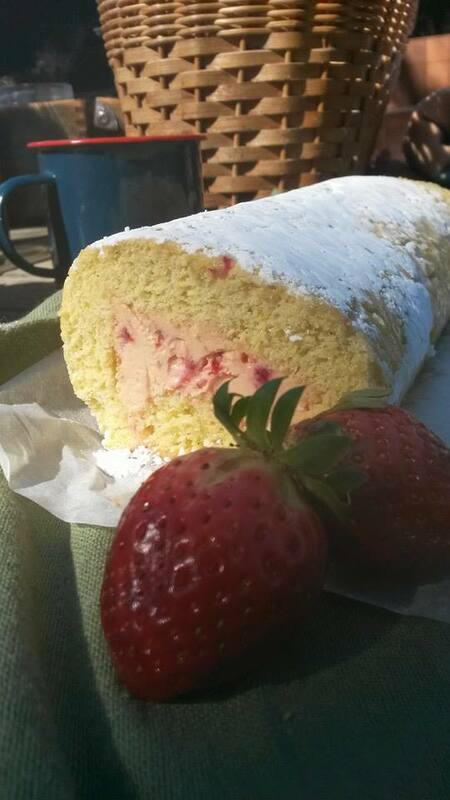 Turn the sponge onto the icing sugar and spread with the strawberry cream. Roll up the sponge, using the baking paper as a guide. Wrap it in baking paper and refrigerate seam-side down to set. Dust with icing sugar and cut into slices to serve. This entry was posted in Dessert, Morning or afternoon tea, Summer and tagged cake, fruit. Bookmark the permalink. It was Liz, it really was.